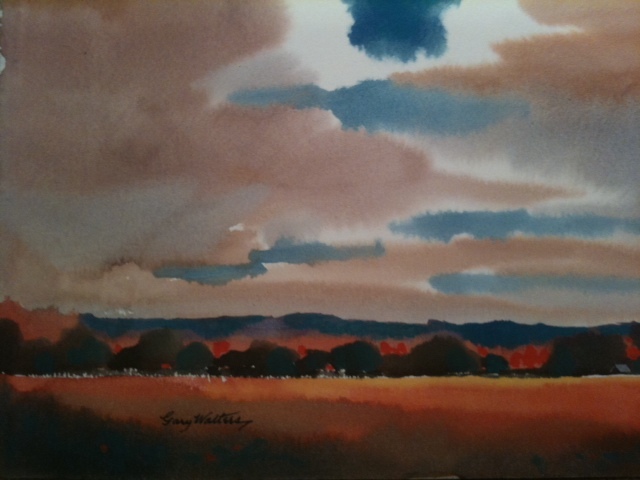 Gary Walters’ watercolor paintings of the delta land in Mississippi deserve the honors and awards they receive. The rich colors he chooses for the farmland, riverbanks, old wooden buildings, and blues music are an invitation to feel the weather, smell the summer air, listen to the rich, slow music of the Mississippi river. But for all the beauty and mystery and wonder these images evoke, Gary says they do not portray the truest masterpiece. When I met him this summer, I found out what his artist’s eye sees as the truest masterpiece in all the world. It all started at a family reunion that wasn’t my family. For about seven months, I’d been journaling for a dear friend, Lena, who is 96. Listening to her stories of farming struggles, medical practices, and radically difficult daily routines taught me more than any text ever had. And in all of Lena’s stories ‘family’ was her focus. So when a reunion was planned, a reunion where she would get to see even her relatives from Mississippi once again, she could hardly wait. Because Lena wouldn’t be up to one of the planned events, a boating day trip in the hot sun, that’s where I came in. I was invited to join them so I could stay with Lena at the resort when she tired. At the resort entrance, Lena’s daughter drove up to meet me, because my GPS stopped working at the entrance. We drove down a road that reminded me of a river with many tributaries, parking lots to the left and right. When we finally got to our parking lot, I wasn’t so sure what I had gotten myself into. I was way away from everything familiar, I only knew well Lena and her daughter, and there were a bunch of people I’d be meeting who I’d never seen at all. I decided to slip in quietly, stay by Lena, and try as much as possible not to intrude on the family reunion. I felt at home (and very humble). A taller man with white hair and a radiant welcome smile came up to me right away and introduced himself with a magnificent southern twang as . . . Gary Walters. He wanted to know about me being a teacher, because, it so happened, he explained, he, too, was a teacher. I talked at length about teaching elementary students and the joys and privileges of my job. He said he was an art teacher for college students. At the end of our conversation, Gary said he had something in his car he wanted to give me to show my students. Well, who doesn’t love gifts? I followed him out to his car, and he handed me an orange hardcover book called Delta Dreamin’. As I read the introduction, I realized this published book was Gary’s art! Here I had been going on like we were equals in our teaching career and yet, looking at him, I realized it could be no other way in Gary’s mind. Throughout the weekend, I was a student watching Gary’s respect for every person with him, his gentle kindness, and his gift for ‘painting’ encouraging word on each life so that you actually believe them to be true. Gary and I kept in touch after the reunion. And for my birthday a package came. I opened the birthday card, and inside Gary had drawn a picture of a sailboat. And, inside the package were three original paintings from his book Delta Dreamin’. I could not believe what Gary had done for me. But then, I could. Because the truest art to Gary is not the Delta, as breathtaking as it is. The most beautiful masterpiece is how the Lord Jesus Christ paints His watercolor of love across our hearts . . . .and makes us family. Happy birthday, Gary. Thank you for becoming part of my family.